The history of All Saints traces back to 1914 when a young missionary priest named Fr. Constantine Buketoff established our parish. Coming from Ss. Cyril and Methodius (now Holy Trinity) in New Britain (where he had been since 1907), he also became the first pastor at All Saints in 1914. The Mitered Archpriest was also responsible for establishing parishes in Terryville (1908), Meriden (1911), Norwich (1915), Willimantic (1916) and Springfield, MA (1916). Also playing a major role in the formation of the new parish was the SS. Peter and Paul Brotherhood, which brought together many Russian-American families, elected officers, established dues, and raised funds to assist their fellow Slavs. The first church building was located at 484 Broad Street, in very close proximity to the Connecticut State Capitol. According to the American Orthodox Messenger in 1918, other clergy serving at All Saints were Rev. Basil Amatoff, Assistant Rector and Rev. Deacon A. Gregorieff. A very turbulent time for Russian Orthodox parishes came in the 1920s. Throughout the country, rival factions faced conflict from within and without. 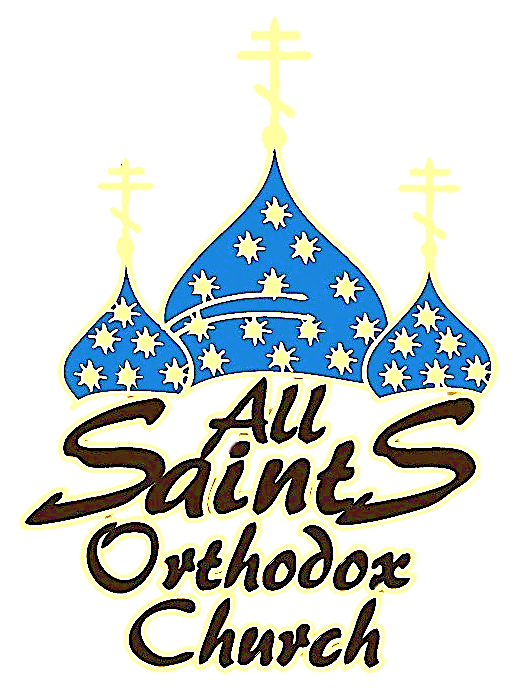 Although there continued to be great tension between the Metropolia (now the OCA) and the Russian Orthodox Church in the late 20s and early 30s, renewed stability would come to our parish in 1931 with the decision by the Supreme Court of Connecticut, ruling in favor of All Saints (against Kedrovsky of the “Living Church,” who was attempting to seize church property). During this uncertain period, Fr. Nicholas Wasilieff was appointed (by Archbishop Appolinary of ROCOR) as pastor. Born and educated in Moscow, Fr. Wasilieff became the longest-serving pastor of the parish: 27 years as rector. All Saints celebrated two major milestones in the 1930s with large celebrations in 1934 and 1939. 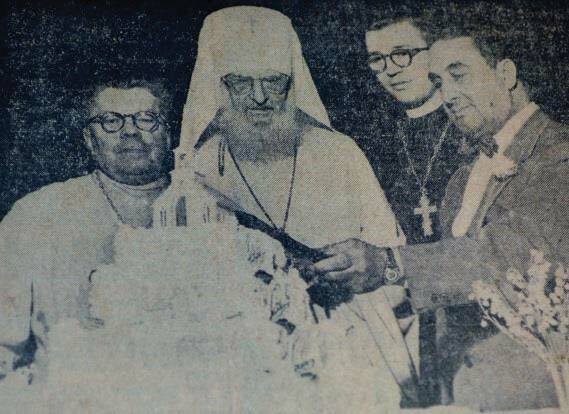 His Eminence Tikhon (Troitsky), Archbishop of North America and Canada (ROCOR), led the celebration at the parish’s 20th anniversary in 1934 that was attended by Connecticut Governor Wilbur Cross. Later that decade, in 1939—during a period (1935-1946) in which the OCA and ROCOR had temporarily reconciled— Metropolitan Theophilus (OCA) celebrated at the 25th Anniversary event with a dinner held at the Foot Guard Hall. During the late 1940s, the OCA and ROCOR would split again, with All Saints continuing on as a parish of the Orthodox Church in America, then called The Russian Orthodox Greek Catholic Church, or “Metropolia.” The 1950s were another interesting era in our history. With hopes of appealing to the younger (and increasingly English-speaking) generation, the church council in 1952 petitioned Metropolitan Leonty to assign an American born priest to assist Fr. Wasilieff: Fr. Michael Margitich joined All Saints as assistant pastor in 1953 while serving as a Chaplain in the Air Force Reserve. He was transferred to Active Duty the next year with calls from parishioners for his return to the parish after his tour of duty. Their wishes were never realized as he found himself on the West coast. The now Mitred Archpriest Michael has since retired and is currently pastor emeritus of The Protection of the Holy Virgin Mary Orthodox Church in Santa Rosa, California. Fr. Wasilief officiates at George & Helen Bugai's wedding in a packed church on Broad St.
Over the years the parish grew significantly during the long pastorate of Fr. Wasilieff, to the point that the church edifice on Broad Street was becoming too small to adequately serve the needs of the parish. To remedy the situation, the parish voted in 1955 to proceed with the building of a new church building. A building committee was established and, in 1956, the current four-acre site at 205 Scarborough Street was purchased for $25,000. However, it would be another eight years before the new All Saints Church edifice would become a reality. Despite the vote and the purchase, concerns about finances and plans stalled the project initially and the prospects of a new church looked bleak. During this lull in activity, conflict arose and Fr. 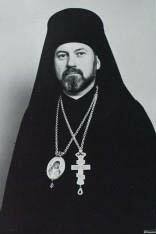 Wasilieff left the parish in 1958, later becoming the pastor of St. Panteleimon’s Russian Orthodox Church (ROCOR) in Hartford, Connecticut. Fr. Wasilieff remained there until his death some years later. Met. Ireney (left) and Fr. Michael Dirga (right) at the consecration of the new cornerstone as part of the 50th Anniversary. Fr. Michael Dirga was assigned to lead the parish later that year, bringing not only renewed spiritual leadership, but the motivation and direction needed to complete the building project. The project gained significant traction shortly after Beatitude Metropolitan Leonty visited the parish on June 26, 1959 to bless the grounds. Fr. Dirga initiated a fund-raising campaign to build the new church, issuing $500 bonds to willing parishioners that would be paid over three years. In 1963, the parish voted on plans and authorized the Building Fund Committee to proceed with construction and ground was broken in June of that year. The next year on June 14, 1964, the new edifice of All Saints was dedicated as part of the 50th Anniversary celebrations; Archbishop (later Metropolitan) Ireney officiated at the consecration. Hundreds of parishioners and visitors from other Orthodox churches throughout the Northeast attended the dedication and reception that followed at the Hartford Statler Hilton. 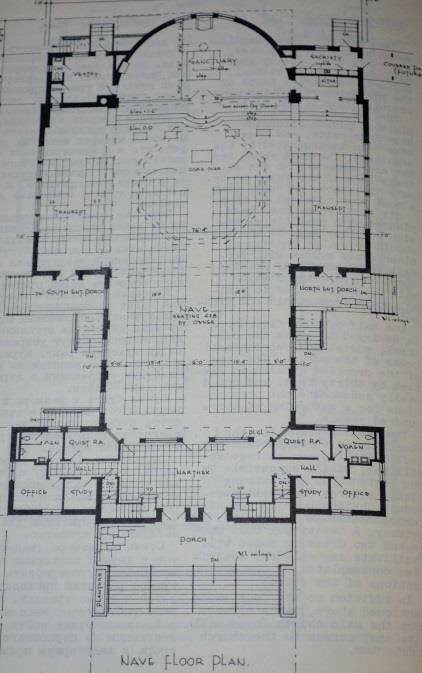 Plans for the Narthex, Nave, and Sanctuary as initially presented. Notice that in the upper-right-hand-corner, there was originally going to be a second iconostasis and altar, perhaps for week-day services when attendance would be lighter. Built in the shape of a cross, commemorating our Lord’s Passion, the edifice is 103 feet long and 66 wide at its transepts. It was built to seat 500 people—300 in the main part of the Nave, 64 in each transept, and 80, including the choir, in the balcony, which is now used exclusively as the choir loft. There are chapels in both the north and south transepts that are named Chapel of Memorials and Chapel of Sorrows, respectively. The initial drawings show a plan for a second altar and accompanying iconostasis where the Golgotha is currently placed (south transept, that is, to the right when looking at the main iconostasis). The three golden cupolas (now painted blue with gold stars as of 2015), representing the Holy Trinity, crown the edifice. Icons for the iconostasis, which was enlarged for the move from Scarborough, were painted by the famous Ivan Diky at that time in the tradition of Andrew Rublev, a follower of the Novgorod School, who painted in the 14th century. The icons include our Lord and Holy Mother, St. Alexis, St. Nikon, Archangels Michael and Gabriel, St. Stephen, St. John the Baptist and our patron icon, that of All Saints. A large rectory adjacent to the Church was built within a few years by Uremko Builders, Paul Uremko being a parishioner of All Saints. The rectory was dedicated Jan. 2, 1966. A large rectory adjacent to the Church was built within a few years by Uremko Builders--Paul Uremko being a parishioner of All Saints--and was dedicated Jan. 2, 1966. The rector, after serving four pastors, underwent extensive renovation in the summer of 2014. Further changes came in the late 1960s: we received permission in 1968 to switch from the Julian Calendar (or “Old Calendar”) to the New Revised Julian Calendar ( or “New Calendar” which we continue to use). All Saints also received regional acclaim during this period through the efforts of its choir director Boris Evtuschenko who also directed the All New England Russian Choir. 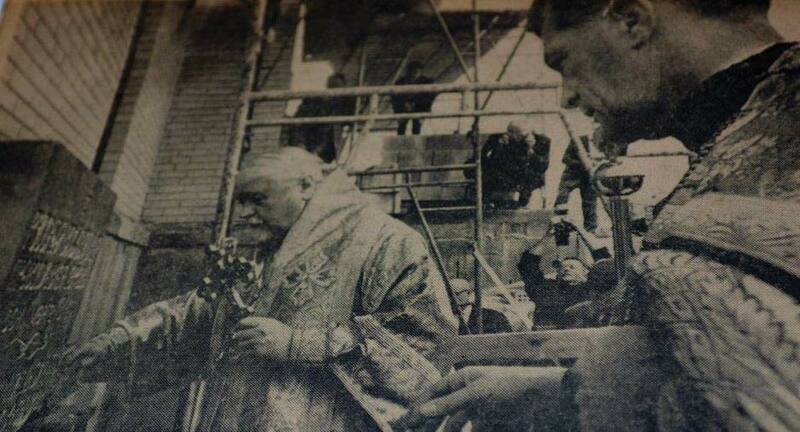 He presented concerts throughout the area that were well attended by Orthodox and non-Orthodox. The rich tradition of Church music continues to this day and the choir continues to be uplifting as it leads parishioners in beautiful prayerful responses and hymns at all services. The choir is currently led by our Choir Director: Michael Stenko and our lead Chanter: Michael Danchak. 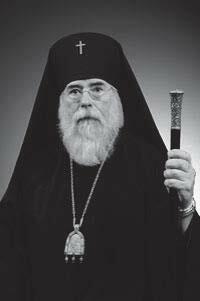 In 1970, our national Church was granted her autocephalous status by the Russian Patriarchate and the Church became the Orthodox Church in America. The next year, Fr. Dirga left All Saints and was succeeded by Fr. William Tarenko for a short time before Fr. Donat Augusta was assigned as pastor in 1975. 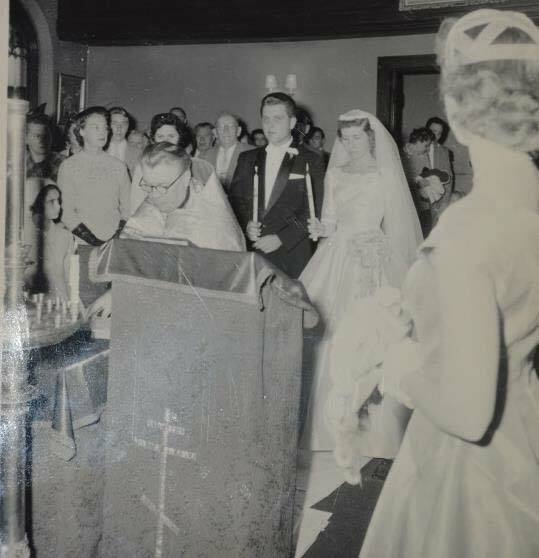 On June 5, 1977, just 13 years after its consecration, our parish had a special mortgage celebration that was officiated by Bishop Dimitri, Bishop of Hartford and Connecticut. A special date in parish history occurred Jan. 29, 1983 when Bishop Job was consecrated in All Saints before an overflow audience of worshippers. Among those present at the historical celebration of the first OCA bishop consecrated in New England were Metropolitan Theodosius, and Bishops Herman (who would later become Metropolitan), Dimitri, Mark, Kyril and Nathaniel. It was during the 1980s that the current glass atriums at the rear of the building were added to ease entry into the Church, especially during inclement weather. It was also during this decade that English would become the primary language of worship at All Saints. 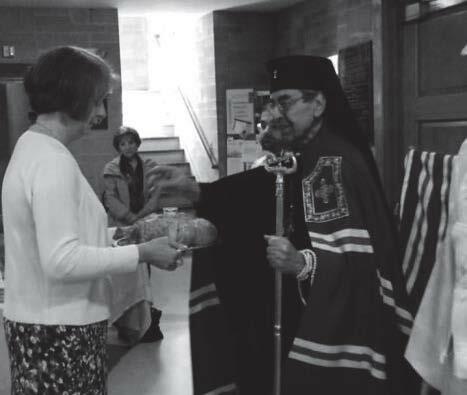 In 1984 the parish celebrated its 70th anniversary with a Hieararchical Divine Liturgy celebrated by Bishop Job on the Synaxis of All Saints, followed by a banquet in the church hall. 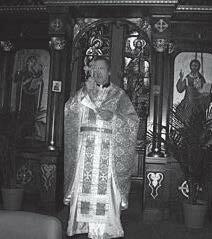 In 1989 the parish marked its 75th Jubilee with a Hierarchal Divine Liturgy on July 25, celebrated by His Grace Bishop Job along with Fr. Don, Fr. Basil Grisel, who had been ordained to the Holy Priesthood at All Saints, and others. An anniversary dinner dance at the Treadway Inn, Cromwell, brought together guests from churches throughout the state to celebrate the anniversary. In the early 1990s, the Church also undertook a major reconstruction project of the front steps of the Church, as well as other projects. 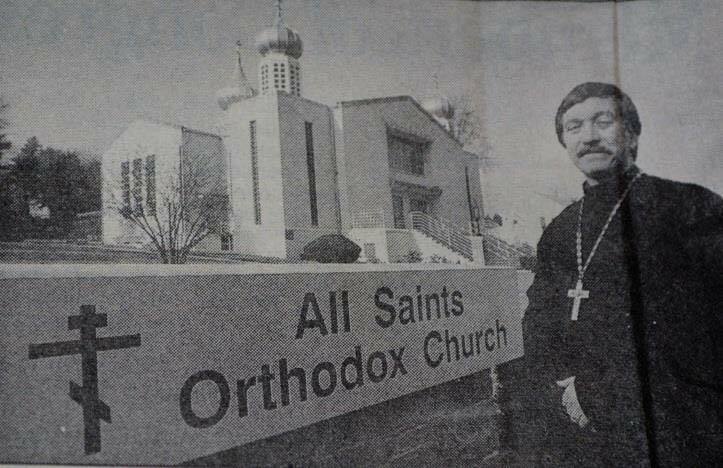 A new stone sign with the simple words “All Saints Orthodox Church,” (which made headlines for dropping the word “Russian”) was dedicated Dec. 6, 1992. As the years went on, many attempts were made to revitalize the parish, including attempts to encourage congregational singing, adult education, and greater lay participation in services. This period also saw the end of Bingo at All Saints. After a period of conflict and division in the late 1990s, came the departure of Fr. Augusta in 1995, and the assignment of Fr. William DuBovik later that year. With the Millennium approaching, Fr. William proposed ‘Project 2000’ with the following goals: the enhancement of iconography in the Church; providing accessibility; and the restoration of the domes. 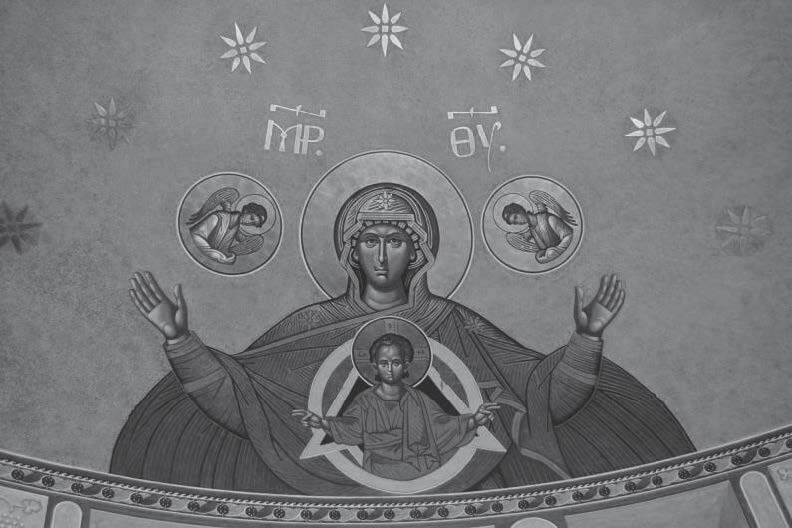 An iconographic fresco above the altar was completed by noted Russian iconographer Victor Kazanin, including icons of the Ascension of our Lord; and of Our Lady of the Sign in which the Theotokos holds the child Jesus. 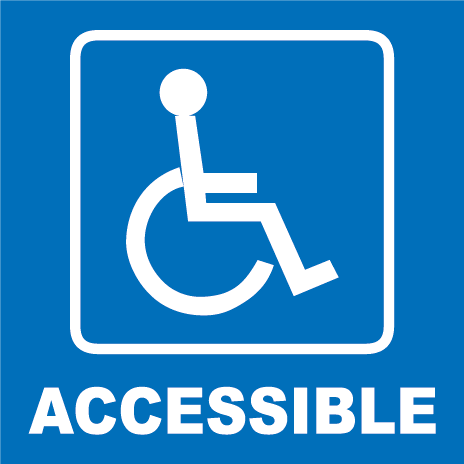 A ramp was constructed that allows parishioners with walking difficulties access to the church, and a bathroom for those with disabilities was added to the main floor of the church edifice. Further iconography was added as individuals and families began donating feast day icons to the church which are venerated on feast days and otherwise adorn the walls of the church. Large frescoes of St. Basil and St. John also were added, as were medallions above the sanctuary with ten saints. All of the work was completed by Viktor Kazanin and was later blessed by His Grace Bishop Nikon, who had become bishop of Boston and the New England Diocese. At the turn of the millennium, the parish marked its 90th anniversary with a Hierarchal Divine Liturgy celebrated by His Beatitude Metropolitan Herman, followed by a banquet held at the Avon Old Farms Inn; Fr William was also elevated to the rank of Archpriest. Looking forward to the upcoming centennial, Fr. William redoubled his efforts to encourage outreach and increased liturgical participation. This also extended to the electronic age with the Church establishing a website, expanding its advertising in regional newspapers, social media sites, mail campaigns, open houses, lectures and the like. As the years went on, Fr. William’s health began to steadily deteriorate; despite numerous ailments and bouts of severe pain, he continued to serve the parish faithfully until his death on June 6, 2013. Archbishop Nikon and numerous clergy from the surrounding area participated in the funeral service at All Saints. 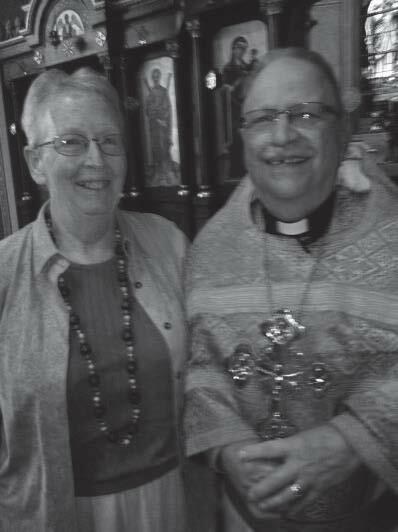 For many months in 2013, the parish was served by a rotating schedule of supply priests. On November 1, 2013 Fr. James Parnell, a priest originally slated to become an assistant to Fr. William while completing a hospital chaplaincy program at Hartford Hospital, was assigned as pastor. 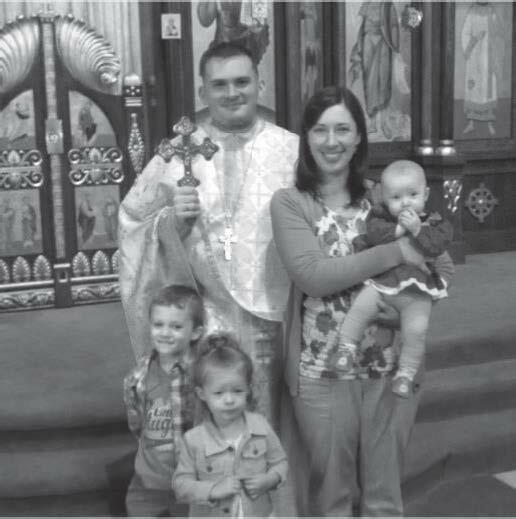 The young priest, having just graduated from St. Vladimir’s Seminary, along with his family, reoriented their focus on this new and exciting venture. Like his predecessor, Fr. James came to a parish that was facing a significant transition; healing was a primary focus during his first year of ministry. Beyond this ministry of healing and restoration, Fr. James worked diligently in building on Fr. Williams’ efforts at revitalization, outreach, and increased liturgical participation and parishioners responded with renewed vigor. 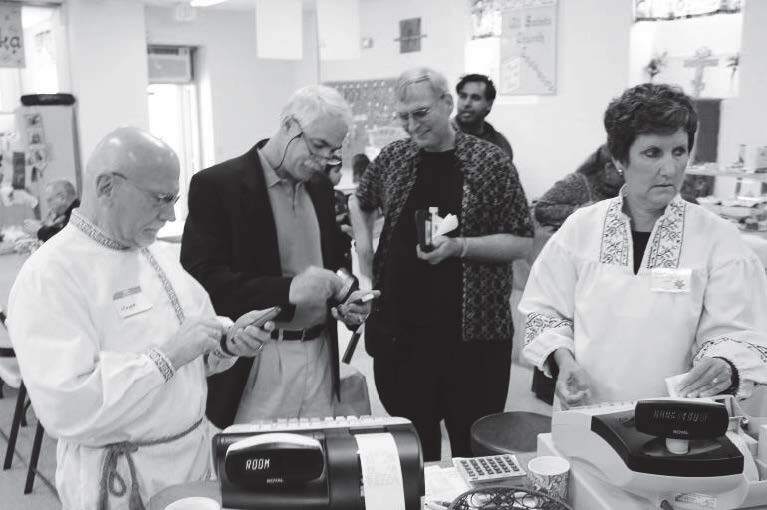 Shortly after the assignment of a new pastor, the parish’s Russian Tea Room and Bazaar marked its 40th year. The event continues to grow in popularity throughout the region and is a testimony of our fellowship and teamwork; it is also a key component of our fundraising and outreach in the life of the parish. 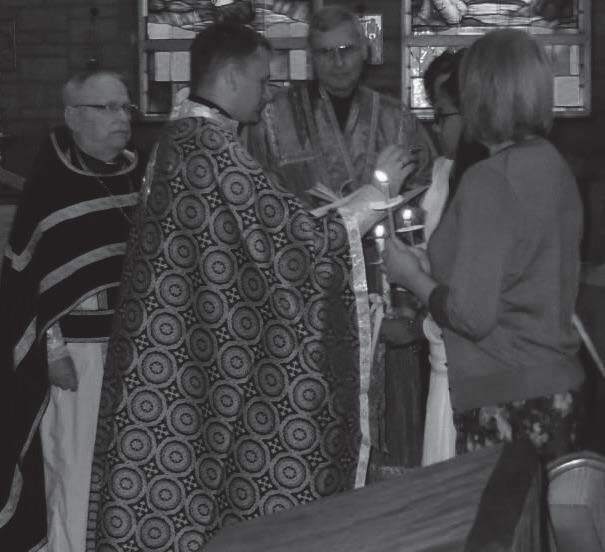 Just prior to our celebration of our 100th Anniversary, the parish gathered as it's first catechumen in years was chrismated on Holy Saturday, whose entry into the Church was followed by a flood of child baptisms during the summer of 2014 and a line of interested individuals seeking to enter into the fullness of the Orthodox Faith. On May 3-4, 2014 the parish celebrated its 100th Anniversary with a Festal Vigil with Litya on Saturday and a Hierarchical Liturgy on Sunday, both celebrated by Archbishop Nikon and clergy from throughout the state. Metropolitan Tikhon, who had planned on celebrating, was unable to attend. Concelebrating clergy included Fr. James Parnell, Fr. John Kreta (Chancellor), Fr. David Koles (Dean), Fr. Donat Augusta, Fr. Joseph Irvin, Fr. Daniel Moldovan, pastor of the Holy Transfiguration Romanian Mission in Manchester, Protodeacon Paul Nimchek from Ss. Cyril and Methodius in Terryville, Deacon Gregory Curran from Christ the Savior in Southbury, Subdeacons Nektary and John Barone from Three Saints in Ansonia and Ss. Peter and Paul in Meriden, respectively, along with the parish Altar Servers, led by Subdeacon Luke “Chet” Andrzejewski. The Vigil was followed by a dinner in the church hall, prepared by Chef Chris Evans with the help of many fellow parishioners, and the Liturgy was followed by a banquet at the Gallery in near-by Glastonbury, where the faithful not only celebrated not the past 100 years but looked ahead to the next 100 years. As the parish continues to grow, not just in numbers, but in faith and love, the faithful parishioners of All Saints look forward to how God will use this parish for His glory. 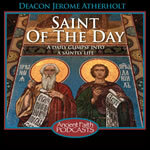 to not only be members of All Saints, but also to be Saints.